Referenced by build_exports(), build_stubs_output_lib(), build_stubs_output_lib_new(), dump_exports(), and psp_export_start(). Referenced by build_exports(), build_stubs_output_lib(), dump_exports(), psp_export_func_hash(), and psp_export_func_nid(). Referenced by build_exports(), build_stubs(), build_stubs_output_lib(), build_stubs_output_lib_new(), dump_exports(), and psp_export_start(). Referenced by build_stubs_output_lib(), build_stubs_output_lib_new(), free_lib_data(), and psp_export_alias(). Referenced by build_exports(), build_stubs_output_lib(), build_stubs_output_lib_new(), dump_exports(), free_lib_data(), psp_export_func_hash(), and psp_export_func_nid(). Referenced by build_exports(), build_stubs(), dump_exports(), free_lib_data(), and psp_export_end(). 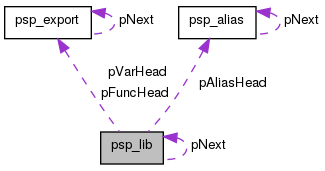 Referenced by build_exports(), dump_exports(), free_lib_data(), psp_export_var_hash(), and psp_export_var_nid(). Referenced by build_exports(), dump_exports(), psp_export_var_hash(), and psp_export_var_nid().